Recently I was lucky enough to get my hands on a Garmin Vivosmart to test. I’ve had a Fitbit One in the past as a step counter, but for various reasons ended up selling it. I’ve also been tempted by a Pebble smartwatch recently after a couple of people I know got one and loved it. 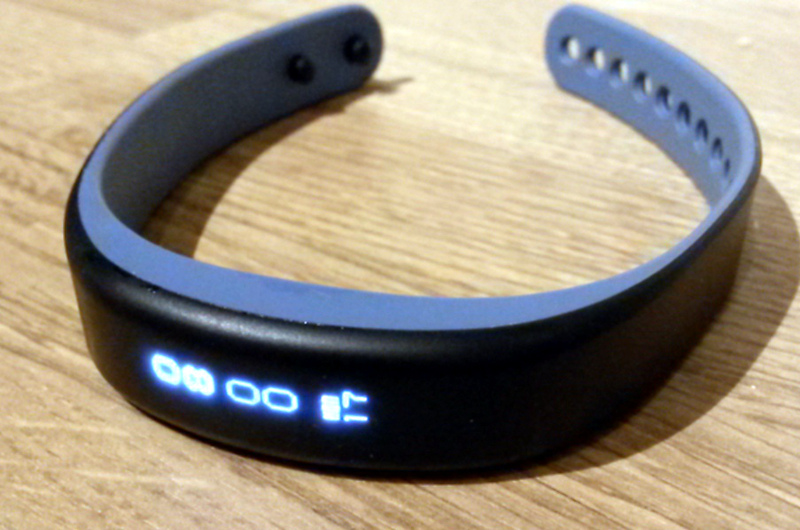 The Vivosmart seemed to combine the two – step counter and phone notifications built into a watch. It’s pretty sleek and stylish, an all-in-one silicone band. Flip it over and you can see the main unit set into the strap. It doesn’t appear to be removable. On the left you can see the four little circles – this is where the charger attaches. The charger itself is a fairly sturdy plastic clip which cradles the watch. It sits quite snugly in the clip whilst charging over USB. It’s well built and solid but light to wear and nicely understated. Reminiscent of the Nike Fuelband, it’s a silicone strap with a slight bulge on top of the wrist. The band itself is fairly narrow and you could pretty much forget you’re wearing it. It’s waterproof, so no need to take it off when you’re in the shower. Battery life is pretty good for this sort of device – they say about 7 days between needing to charge it, which feels about right so far. You can set an alarm (via the app) and the Vivosmart will buzz to wake you up. It’s pretty effective. It tracks your steps, syncs to your phone (please check Bluetooth compatibility before you get one! Needs bluetooth 4.0 and Android 4.3 (or iOS equivalent) at least in order to work) so you can see when you get an incoming call on your phone, texts or emails. I used it with my Samsung S4 Mini (running Android 4.4.2). 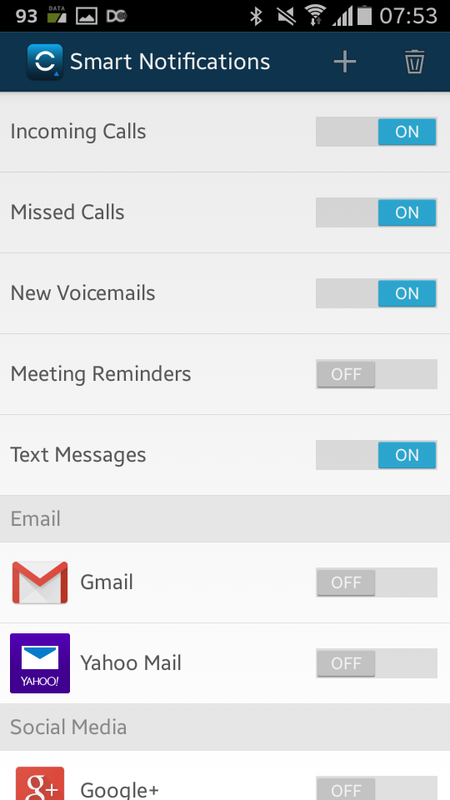 The Android client is pretty good, and you can configure it to display alerts from a load of different apps – GMail, FB Messenger, Twitter etc. I like that it’s all bundled into one unit which you wear on your wrist. One of my key concerns with the Fitbit One was that I’d leave it attached to a pair of trousers when I got changed. I’d forget to clip it to my work trousers. It wouldn’t count any steps I did before I got dressed in the morning. The Vivosmart is always on you, so is always counting. 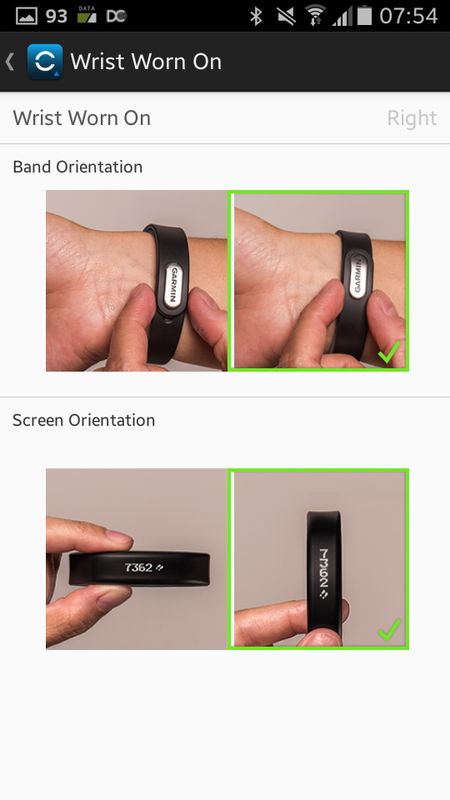 You can configure the display on the Vivosmart so it displays information either vertically or horizontally, and also tell it which wrist you’re wearing it on. However, any incoming notifications always appear in a horizontal display. I found the vertical date/time and step count to work best for me, but it’s pretty easy to change it around. Sometimes it takes a little while for the app to sync the settings with the Vivosmart, which can be a little frustrating and means you think you’ve not set it properly. Once it’s set up though, you shouldn’t need to change it. You can pair the Vivosmart with a Garmin heart-rate monitor or other Garmin products such as bike speed sensors or their VIRB HD action camera. I don’t have any of these, so haven’t tried this. 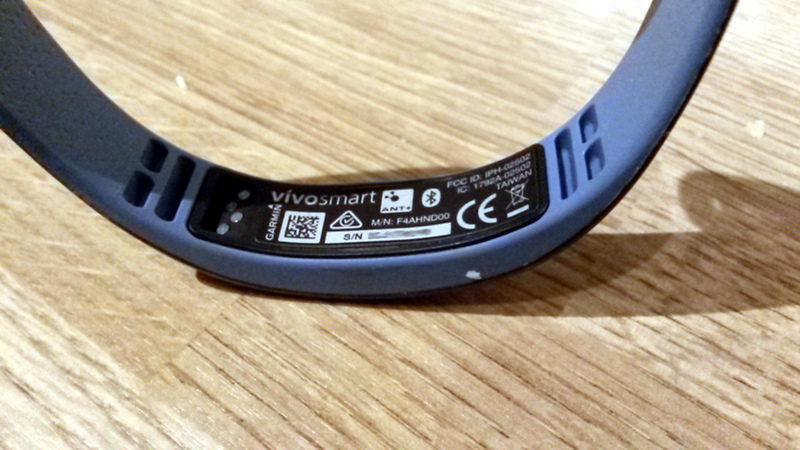 The Vivosmart charges over USB and you get the custom charge cable with it (of course), but no mains plug. I just used one of the many USB charger plugs we seem to be amassing around the house, plugged it in and away you go. It charges fairly quickly. Having the display off by default takes some getting used to. You can set the Vivosmart so that if you raise your wrist, the time/date shows automatically, but It feels a little laggy when the display does kick in – you have to give it a second to respond to the movement. Sometimes that doesn’t work, so you end up dropping your wrist then raising it again. Usually you just want a quick glance to check the time, not have to faff on to get it to display. You can double tap the display to wake it up, but that’s not always convenient. The display itself isn’t as clear as it could be. The actual display bit seems to be behind a thin layer of the silicone strap, so it’s visible, and is fine, but it’s not as clear as a regular watch face or the Fitbit One’s display, for example. You can adjust the brightness of the display, which helps a little. If you’re a keen Twitter user like I am, you’ll probably very quickly turn the notifications off. It’s easy to do, but when you get into a twitter chat, having your Vivosmart buzz on your wrist every few seconds gets a bit annoying after a while! I’ve noticed that it drops the bluetooth connection fairly regularly, which is a pain if you’re using it to keep an eye on notifcations. It could just be my phone though. I’ve also had a couple of occasions where the phone and Vivosmart just completely refuse to talk to each other. Sometimes I’ve noticed the connection drop, left it for a while and it reconnects. Also, turning bluetooth off and on again on the phone usually reconnects. I’ve had to unpair and repair the device to get my phone to recognise it, but only the once. The strap can be a bit fiddly to put on. 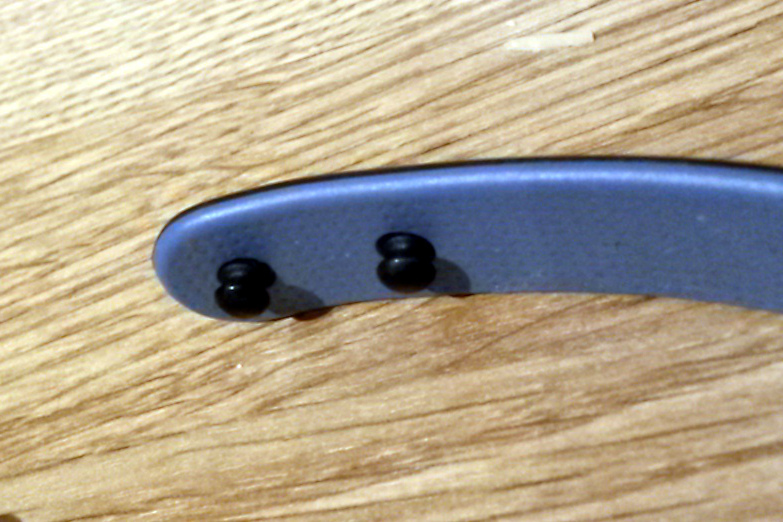 There are two little studs which pop into the holes on the strap and sometimes it can take a couple of goes to get them lined up. I’m a little worried about the longevity of the strap too. I’ve gone through a number of silicone/plastic watchstraps in the past, including a Garmin Forerunner 50, where the strap has worn out and failed at the holes. It’s not clear if you can get a replacement strap if it fails and popping/unpopping the strap could potentially put some strain on the strap holes. It feels fairly robust, but it’s just something which worries me at least a little. Lastly and perhaps most importantly, I don’t entirely trust the step count. First few days I used it I was clocking in at 12 to 14 thousand steps. As I mentioned earlier, I had a Fitbit One for a while and never came near that in my regular daily routine. I noticed as well that when I was drying my hair after a shower, the step count would go up. If I watched the step count as I was walking down the road, it’d go up in twos to match my stride, but every now and again it’d skip and count three instead of two. So accuracy is a bit hit and miss. Overall, it’s a nice little gadget which could have been great. All the component parts are there – watch, activity tracker, very configurable when it comes to notifications, decent app, good website to track your stats. It’s just not quite there. 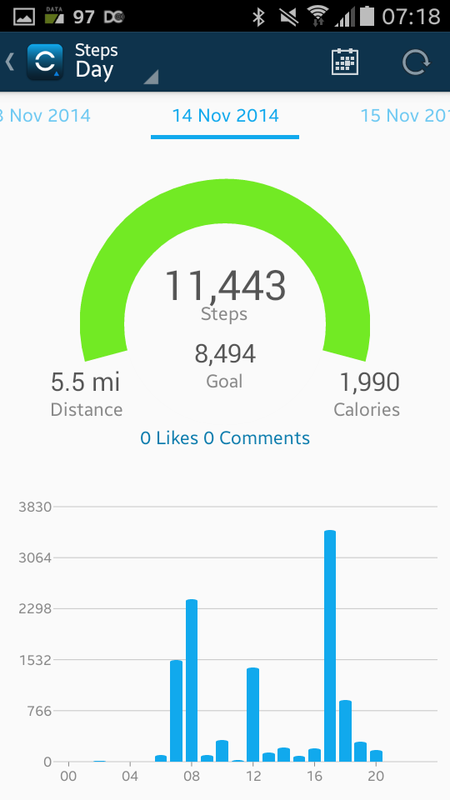 The inaccuracy of the step count is fairly major. Maybe Garmin will release a firmware update which will fix this. I think given the choice I’d get another Fitbit One for accuracy of tracking steps (with the added bonus of counting stairs climbed) and a Pebble for notifications – having an ‘always-on’ watch face is something I’ve realised that I miss. I know that Fitbit are also releasing some new models of their wrist-mounted activity trackers, so it’ll be interesting to see how they stack up against the Vivosmart. Disclosure: Thanks to Amazon for sending me the Garmin Vivosmart to review. The opinions in the review are entirely mine.